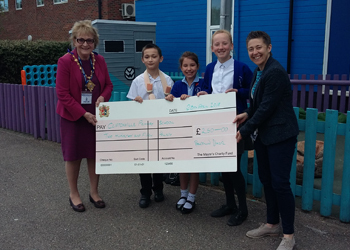 The Mayor and Charter Trustees are pleased to be able to present Cliftonville Primary and Pre-school with a cheque for £250 from The Mayor's Fund. This donation will help fund a sensory, quiet garden for the children. The Mayor of Margate, Cllr Rosamund Dixon, says "It is so important for children to be able to have access to a quiet space during their busy school day. I, and the Charter Trustees are very pleased to be able to assist with this project and hope that many children will be able to enjoy this garden for years to come".